Chief Bettencourt leads the band during the Star Spangled Banner prior to the game. 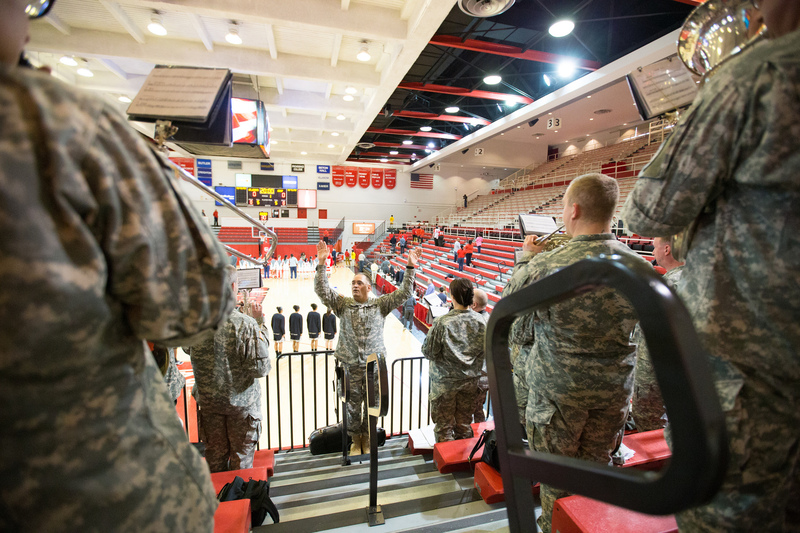 On Thursday, March 19, the band headed down to St. John’s University in Queens to cheer on the Army Women’s Basketball team in the first round of the WNIT tournament. 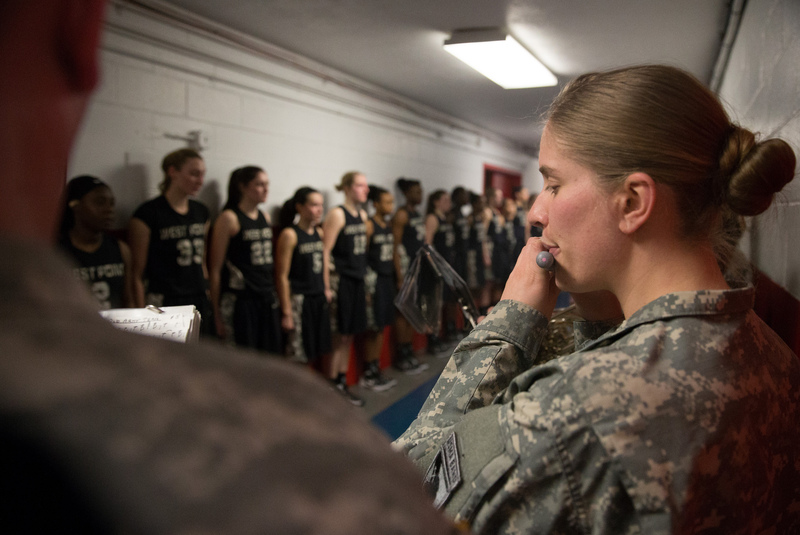 The band does not often play for basketball games, but for the second year in a row, the mighty Army Women’s team has qualified for a major tournament while the rest of the cadets are on spring break. That means that the cadet band is not around to perform for the game, so we take it upon ourselves to support our fellow Soldiers. Sgt. Major Jones charges out of the rehearsal room to cheer Army on. The game was a close matchup, with Army remaining within a few points of the St. John’s Red Storm the entire game. You can read a complete game wrap-up here. While the outcome of the game was a disappointing loss for all of the Army fans in attendance, (which there seemed to be more of than St. John’s fans, even though it was a home game for the Red Storm) it is what happened after the game that truly moved me. 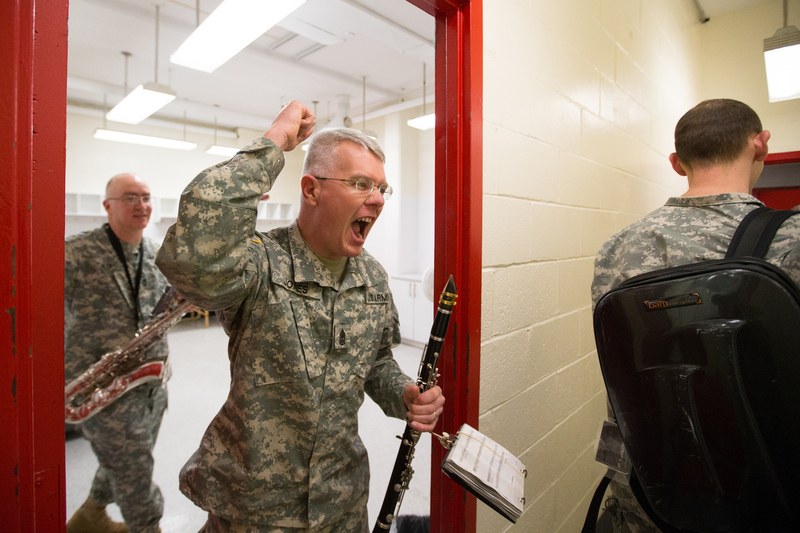 Traditionally, after every Army sporting event we perform for, we play the Alma Mater, win or lose. I’m not sure if the women’s team was not used to it, or just wanted to get back to the locker room, but they left the court before we had a chance to play for them. Chief Bettencourt took the entire band down into the tunnel outside of the locker room to play the Alma Mater for the team. We all stood, drawn up in a long line against one wall, while the team filed out of the locker room and stood at attention against the opposite wall, along with their coaches and other team personnel. They looked downcast, as if they had just lost an important, close, hard-fought game. For a time, it looked as if they would all rather be alone than stand facing us while we played for them. But, bringing dignity, hope, and esprit de corps to all situations is what military bands do best. Chief Bettencourt leads the band in the West Point Alma Mater. As we started the first tones of the music, immediately I could see the expressions on the player’s faces begin to change. At first a few sang, then a few more, finally all sang in full voice. You could see each cadet remembering that this game, win or lose, is only preparation for the true test they all will face one day after graduation from West Point. 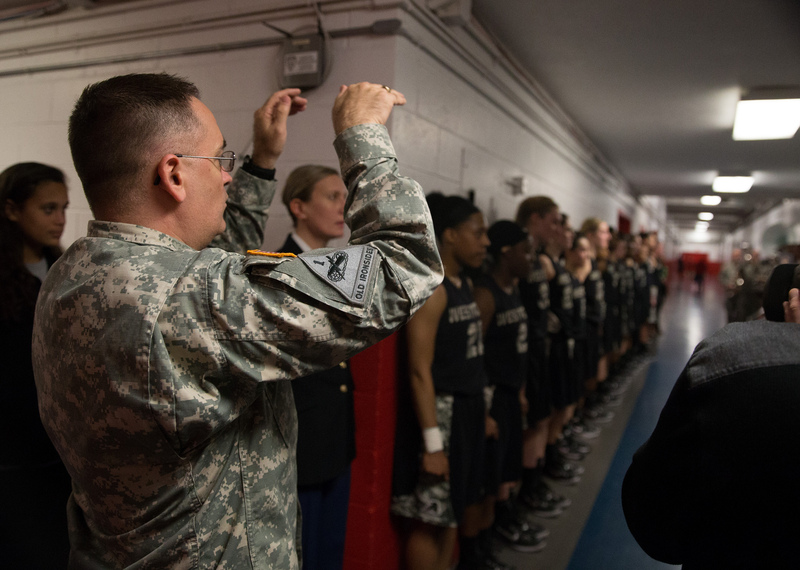 Cadets are part of something much larger than a basketball game, and we were able to bring a sense of perspective to the team, enabling them to look down the long gray line, and see what they were a part of. The band performs the Alma Mater for the Women’s Basketball Team after their loss to St. John’s. Reblogged this on Last Row Music Blog.